We’ll never forget the text from Fellow Flowers. Fellow Flowers is a national women’s running community that celebrates WHY women put one foot in front of the other, in running and in life. The flower connects women with their purpose – green for courage, purple for no-excuses, orange for fiercely united, and so on. When the TODAY Show was covering an 8-week feature on women and the reasons they train for races, we knew Fellow Flowers was a perfect fit. So we sent an email pitch. We took our email pitch a step further by harnessing the power of community. We asked women to submit their reason for running to the TODAY Show, and advised each of them to begin their story the same way: My name is Mel, and I am a Fellow Flower. I am a green flower because I run for courage, and here is my story. We also tweeted individual TODAY reporters, hoping to get their attention. In a producer’s meeting, TODAY Show host Erica Hill asked her team: who are the flowers? Soon after, the TODAY Show emailed us back. After hearing the Fellow Flowers story from the founders, they asked to shoot on-location in Madison to meet the founders and tell their story. (Watch the segment here). It aired on a Saturday three different times. More importantly, there were long-term effects after this burst of traffic based on the segment date. Including media opportunities with local NBC affiliates, new potential sponsorship opportunities and a growing overall awareness of the brand. 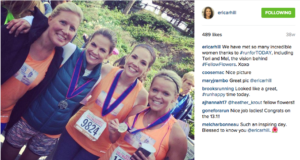 Later that year, TODAY host Erica Hill also joined the Fellow Flowers’ annual event, Rock Retreat Run, as the keynote speaker to talk about how she became a runner and running’s impact on her life. Long story short, the segment aired and sales soared. Email subscriptions increased by 40%, and site traffic increased by 70%. Even so, we knew we had to play the long game too. We leveraged the segment to secure coverage in local NBC affiliates and to build a relationship with TODAY’s Erica Hill. She invited Fellow Flowers to TODAY’s race in NYC – and she even came to speak at the Flowers’ inaugural event, Rock Retreat Run.